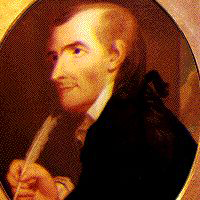 Francis Hopkinson, American musician and author, was one of the signers of the Declaration of Independence. He was both a church director and choir leader and put to music the Psalms of David. He represented New Jersey in the Continental Congress and later served as chairman of the Navy Board. It was in this capacity he is said to have designed the first American flag. He wrote essays supporting the adoption of the Constitution and served as a judge of the United States District Court before his death.